Take a look at this 2019 Newmar Mountain Aire 4550 Quad Slide Class A Diesel Pusher! Please review the information provided and call our professional sales team toll free at 1.888.385.1122 today with any further questions you may have regarding this unit. Fiberglass Roof with Walkable Decking and Intergrated Gutter Rail, Gelcoated Fiberglass Exterior Sidewalls, Front and Rear Caps, Aluminum-Frame Sidewalls & Roof Construction, 16" on Center, 5/8" Foam Insulation Laminated in Sidewalls & Ceiling, Polar Pak R19 Batten Insulation on Roof, Automatic Mechanical Lock Arms on Non-Hydraulic Slideout Rooms - Paddle Style, and more! 12.5 kW Cummins Onan Diesel Generator, 50 Amp Electrical Service with Flexible Cord with Automatic Transfer Switch, Six 6-Volt House Batteries, Battery Disconnect Switch for House Battery, 10 Watt Solar Panel to Charge Chassis Battery, 3000 Watt True Sine Inverter, Emergency Engine Start Switch, Engine Block Heater, Energy Management System, Exterior Security Lights, Midship Side Turn Signals, LED Lights Recessed in Ceiling and Underneath Overhead Cabinets, Accent Lights in Feature Ceiling, Slideout Fascia Trim, Lambrequins, LED Lighting in Pull-out Pantry, Kitchen and Bathroom Base Cabinets, LED Lights in Exterior Storage Compartments on Automatic Switches Controlled by Interior Master Switch, LED Lights Installed Under Door Side Slideouts, Lights in Wardrobes, Manually Operated Hold-To-Run Slideout Switch, Automatic Generator Start on Low Battery or Temperature Setting, Cable TV Connection, Interior Courtesy Lights, Dimmable Adjustable Aim Reading Lights at Head of Bed, USB Charger at Dinette & Bedroom Night Stand, USB Outlet at Dash for Driver Use, USB Outlet at Head of Each Bunk Area*, Power Rewind Wheel with 50' Cord, Recessed Docking Lights, Secondary Multiple Touchscreen in Bedroom, Silverleaf Multiplex Electrical Wiring System, Solar Prep with Six Gauge Wire from Roof to House Battery, Spare Fuses in Chassis and House Fuse Panels, Wireless Phone Charger Pad in Driver Area, and more! Demand Water System, Sewage Holding-Tank Rinse, Dometic 321 China Bowl Stool or Macerator Stool*, Solid Surface Shower Walls with Glass Door, Fold Down Shower Seat, Water Filter for Entire Unit, Exterior Shower, Auto Fill for Fresh Water Tank, Power Water Hose Reel, Hot Water Line to Generator Area*, and more! Stainless Steel 30" Convection Microwave with Recessed Two Burner Cooktop, Air Horns, Whirlpool 19.7 Refrigerator, Prep for Two-Piece Washer/Dryer, Dometic 3.77 Cf Freezer on Pull-out Tray in Exterior Baggage Compartment, Flush Gas Cooktop Cover of Matching Countertop Material, Central Vaccuum with Tool Kit, and more! Sony LED TV and Blu-ray Disc Players in Living and Bedroom Areas* (TV Sizes Vary Per Floor Plan), Sony 43" 4K LED TV in Front Overhead, Sony 49" 4K LED TV on Televator in Living Area*, Bose 300 SoundTouch Soundbar, Bluetooth Microphone for Sony Dash Radio, Glass Dash Instrument Panel, Xite Dash Radio, 10" Dual Monitor with Rand McNally Navigation, Xite Tri-view Rearview Camera, Rearview Color Monitor System with Audio, Wingegard Rayzar Automatic Digital TV Antenna, Satellite Dish Prep on Roof, Two Bedroom Radio Speakers, TV Jack and 110 Volt Recept in Door Side Exterior Storage Compartment, Cat 6 TV Cables, Infrared Repeater System to Operate Audio/Visual Components, WiFiRanger Skypro Pack Router, 10 Bc Fire Extinguisher, Smoke Detector, Propane and Carbon Monoxide Detector, Winegard In Motion Wifi, and more! 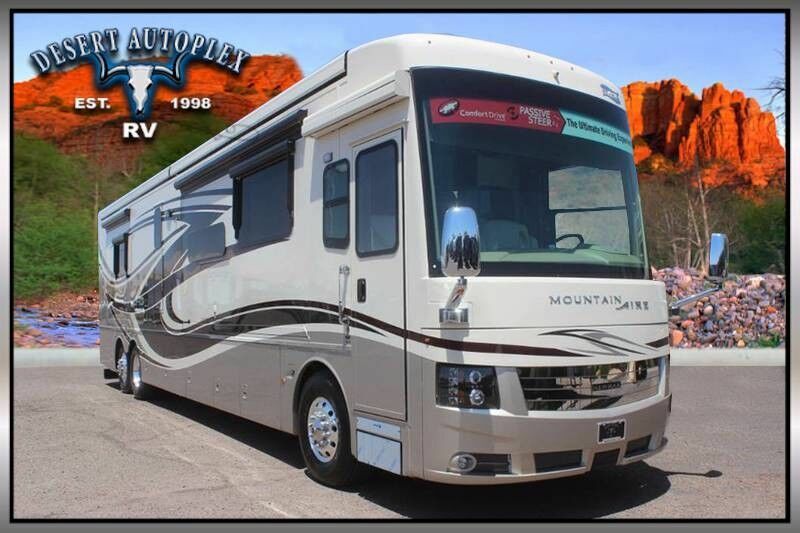 You do not want to miss your chance to own this stunning 2019 Newmar Mountain Aire 4550 Quad Slide Class A Diesel Pusher! This unit is sure to impress. Financing is always available on approved credit, and we will even walk you through your new purchase upon delivery to show you how everything works if you're not familiar already. HURRY, and call our professional sales team toll free at 1.888.385.1122 today before it's too late!